With Universal Credit at the forefront of public policy at present and being rolled out across Northern Ireland from September 2017, Shauna who works on our Jobmatch programme, organised awareness sessions in Magherafelt. The half day information sessions were free to attend. The first information session was for Support Organisations and Groups and was delivered by The Law Centre NI. Shauna said “I thought this session would be beneficial to those working within support organisations so that they are aware of the changes Universal Credit will bring and the impact this may have on the people they work with”. The session took place in our Magherafelt office and was attended by various support organisations including The Must Hostel, Women’s Aid, Belfast Central Mission, Social Services, Positive Futures and Lifelong Learning for Business. Shauna advised, “those who attended found the session beneficial and informative. The morning also provided a great opportunity for networking”. Elizabeth from The Law Centre NI delivering the session on Universal Credit to Support Organisations. The second session was for clients on our programmes. 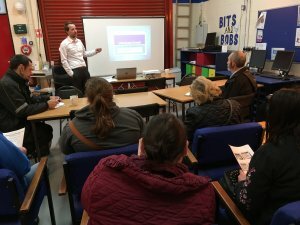 This information session was delivered by Advice NI and took place in The Network Shed. 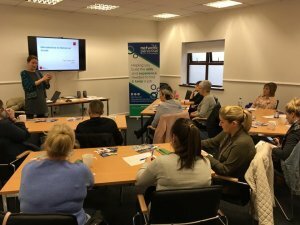 The session provided clients with an increased understanding of Universal Credit, how it might affect them and the basic conditions for entitlement. James from Advice NI delivering the information session to clients in The Network Shed. 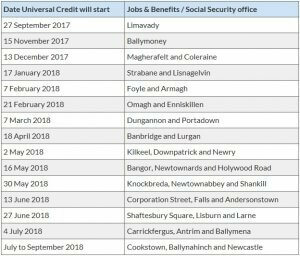 Both sessions also covered when Universal Credit will be implemented in the different geographical areas of Northern Ireland, which can be seen in the table below. We would like to thank The Law Centre NI, Advice NI and everyone who attended the sessions. To keep up to date with future events and sessions we are running, follow us on Facebook. This project is part funded through the Northern Ireland European Social Fund Programme 2014-2020 and the Department for the Economy.